LOS ANGELES, Calif. — "Rarely can you see, let alone own, a handwritten manuscript by someone like F. Scott Fitzgerald," said Nate D. Sanders, who is auctioning the original poem. "It's an extraordinary finding that comes along maybe once every 10 to 20 years." Unearthed from the estate of actress Helen Hayes, whom Fitzgerald became close to during the 1930s, Fitzgerald's poem is written to Hayes' daughter, Mary, who was almost 8 years old at the time. Continue reading Handwritten Fitzgerald Poem is Unearthed for Auction on April 2. Chicago, Illinois — On April 10, Leslie Hindman Auctioneers will showcase a fine selection of rare and historical Americana, including books, autographs, and maps, as part of their Fine Books and Manuscripts sale. Leading the sale is an early four-page letter from George Washington, as Commander of the Continental Army, to the Governor of New York, George Clinton, July 30, 1782. Letters from this period in Washington’s military campaign are exceedingly rare, especially with historically significant content. Here, Washington expresses his concern to Clinton for General Marinus Willett’s command of the Mohawk Valley, a strategic and vulnerable point on the Revolutionary War battle lines that had been plagued with numerous skirmishes between Loyalists and Allies. Washington planned to send Willett on a secret mission to recapture the British-held Fort Ontario at Oswego, but expresses doubts: “I wish to be informed … of the force of Willet’s [sic] corps now assembled on the Mohawk, also the strength of the enemy at Oswego, of which I have as yet had only vague and unsatisfactory accounts.” He warns them to be cautious; not to act too quickly. The mission, sent February 1783, would fail, when Willett’s forces were unable to surprise the garrison. It continued to be held by the British until 1796, thirteen years after the Peace of Paris. Continue reading Washington Letter Headlines Leslie Hindman Auction. March 2012 — Woburn, MA — At James D. Julia, our goals include bringing our global community of customers the very finest and most interesting antiques and artifacts possible. At our recent Winter 2013 Extraordinary Firearms Auction — which grossed over $13 million and featured remarkable militaria spanning four centuries — many lots also came with breathtaking provenances. This one in particular, with both deep Civil War and family roots, really caught our attention. The lot, number 1480, was a breathtaking collection of Civil War materials. These items, consigned by a Rhode Island family who were direct descendants of Col. George G. Briggs, were estimated at $45,000 to 65,000. Briggs was the last commander of the 7th Michigan Cavalry and a trusted friend and confidante of Lt. Colonel George A. Custer, the famous officer and cavalry commander in the American Civil War and the Indian Wars. After spirited and competitive bidding, the package sold for $184,000, including the buyer's premium. Continue reading Extraordinary Recent Discovery of Custer Materials Sold At James D. Julia. 28 March 2013 — Sotheby’s is pleased to offer the largest and most important group of William Faulkner material ever to appear at auction on 11 June 2013. Estimated to fetch over $2 million, Property from the Descendants of William Faulkner contains a highly personal selection of letters, manuscript drafts, and drawings, providing a remarkable window into key moments of the celebrated author’s life, including his time in Paris in the 1920s as well as receipt of the Nobel Prize for Literature in 1950. Further glimpses into the private life of this public figure are offered by intimate gifts the author prepared by for his wife and daughter. A portion of the collection was only recently discovered on his family’s property in Virginia, including a number of items previously feared lost. Highlights will be on view at Sotheby’s Paris in late May and in New York in advance of the June sale. Continue reading Largest and Most Important Faulkner Archive at Sotheby’s. Librarian of Congress James H. Billington has named a group of distinguished men and women in the field of literacy to serve on the advisory board for the new Library of Congress Literacy Awards. These awards will be conferred for the first time in fall 2013 to recognize and support outstanding achievements in the field of literacy, both in the United States and abroad. The awards are made possible through the generosity of David M. Rubenstein. Continue reading Board Members Named for Library of Congress Literacy Awards. CHICAGO — The Association of College and Research Libraries (ACRL) Rare Books and Manuscripts Section (RBMS) has selected four winners and one honorable mention for the 2013 Katharine Kyes Leab and Daniel J. Leab American Book Prices Current Exhibition Awards. The awards, funded by an endowment established by Katharine Kyes Leab and Daniel J. Leab, editors of American Book Prices Current, recognize outstanding printed exhibition catalogs and guides and electronic exhibitions produced by North America and Caribbean institutions. Certificates will be presented to each winner at 3 p.m. on Sunday, June 30, at the 2013 ALA Annual Conference in Chicago. Continue reading 2013 RBMS Leab Exhibition Award Winners Announced. New York—Swann Galleries’ Printed & Manuscript Americana auction on Tuesday, April 16, features the Theodore Roosevelt Collection of Peter Scanlan, as well as scarce Mormon items, American Revolution, Civil War and American Indian material, and archives related to famous and notorious Americans. Peter Scanlan began collecting Theodore Roosevelt material as a young boy and continued throughout his life, building a collection that was wide-ranging, with emphasis on books and pamphlets by Roosevelt, and included a choice selection of autographs, books about Roosevelt, material related to the extended family, and posters, photographs, ephemera and artifacts covering the whole of Roosevelt’s life. Of note in the auction are Roosevelt’s memoriam for his wife and mother, who died on the same day in 1884, In Memory of My Darling Wife Alice Hathaway Roosevelt and of My Beloved Mother Martha Bulloch Roosevelt, which had a very small print run and has become one of the greatest printed Roosevelt rarities (estimate: $25,000 to $35,000); a Typed Letter Signed to the acting Secretary of War, William Cary Sanger, postponing a major offensive against the Muslim inhabitants of the southern Philippines, Washington, 20 April 1902 ($1,500 to $2,500); and a family photograph album showing the President and his children, circa 1890-1910 ($4,000 to $6,000). Continue reading Theodore Roosevelt Collection, Rare Mormon Items at Swann Galleries in April. A 1555 copy of Andreas Vesalius’ De humani corporis fabrica with the author’s own extensive hand-written notes and corrections is being made available for study at the Thomas Fisher Rare Book Library at the University of Toronto. The book in question was acquired by a private collector at auction in Germany and has been generously placed on deposit by the owner at the Thomas Fisher Rare Book Library in order to make it available to the wider scholarly community. Continue reading University of Toronto Acquires Annotated Vesalius. DALLAS — A massive six sheet movie poster for Casablanca, one of just two copies known, bid a fond ‘Here’s looking at you, kid’ to its pre-auction estimate of $60,000+ to realize $107,550 in Heritage's Vintage Movie Poster Signature® Auction. Measuring an impressive 81” x 81,” the poster took top lot honors during the March 23-24 event which brought $1.72+ million and was 96.4% sold by value. Continue reading Casablanca Six Sheet Brings $107,550 at Heritage. NEW YORK, March 2013 — Columbia University Libraries’ Rare Book & Manuscript Library (RBML) is pleased to announce the acquisition of the archive of the author Dawn Powell. The collection includes published and unpublished manuscripts, artwork, first editions, and the long suite of diaries that capture her life experiences in New York City during the 1930s, 1940s and 1950s. Powell, a New York novelist whose posthumous champions included Gore Vidal, Edmund Wilson and Matthew Josephson, produced hundreds of short stories, ten plays, fifteen novels and extended diary volumes throughout her lifetime. Despite a prodigious output, Powell’s career was not widely regarded during her lifetime. When she died in 1965, most of her novels were out of print. Continue reading Columbia University Library Acquires Dawn Powell Archive. New York—Outstanding examples of early printed books—including incunabula from the Library of Kenneth Rapoport—are featured in Swann Galleries’ annual spring auction of Fine Books on Thursday, April 11, which is also opening day of the 53rd Annual New York Antiquarian Book Fair. The sale additionally offers fine examples of bindings, illustrated books, literature, science and natural history, travel books and writing manuals. 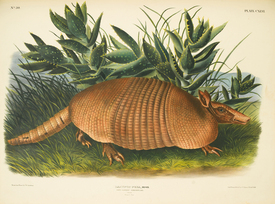 The book with the highest pre-sale estimate in the auction is John James Audubon and John Bachman’s The Viviparous Quadrupeds of North America, a first edition in book form of Audubon’s second monumental and enduringly popular work of natural history illustration, containing 150 hand-colored lithographed plates, New York, 1845-48 (estimate: $250,000 to $350,000). Another richly illustrated natural history lot is a first edition of Daniel Giraud Elliot’s A Monograph of the Tetraoninae, or Family of the Grouse, with 27 hand-colored plates of birds and eggs, New York, 1865 ($10,000 to $15,000). Continue reading Gutenberg Leaf, Audubon’s Quadrupeds Will Lead Swann Galleries April 11. BEVERLY HILLS — J.C. Leyendecker’s Honeymoon, The Saturday Evening Post cover, July 17, 1926, one of the illustrator’s all-time greatest Post covers, is expected to bring $80,000+ as the centerpiece of Heritage Auctions’ April 11-12 Illustration Art Signature® Auction. Continue reading Classic Saturday Evening Post Covers Highlight Heritage Illustration Event. A hand-written manuscript of South African poet Roy Campbell’s translation of Saint John of the Cross, will be offered for sale at Bonhams auction of The Roy Davids’ Collection of Manuscripts to be held in London on 10 April where it is expected to fetch more than 70,000 Rand. Campbell (1901-1957) made the vow to translate the works of the saint during his escape from death at the hands of a Republican mob in Toledo in 1936, when he rescued the saint’s papers from destruction. Continue reading Manuscript of South African Poet Roy Campbell at Bonhams. Beverly Hills, CA — March 22, 2013 — Julien’s Auctions, the world’s premier music and entertainment memorabilia auction house has announced Music Icons 2013, an exceptional auction event featuring a rare VOX guitar played by two legendary Beatles, John Lennon and George Harrison. The one-day auction to take place at Hard Rock Cafe New York in Time Square will also feature an extraordinary collection of music memorabilia including items from the Beatles, Elvis Presley, the King of Pop Michael Jackson, Bette Midler, David Cassidy, David Bowie, The Grateful Dead, Madonna, Jimi Hendrix and much more. The rare offering of a VOX guitar played by both John Lennon and George Harrison is what rock n’ roll legends are made of. The striking custom guitar built by Mike Bennett and Dickey Denney was gifted to “Magic Alex” Mardas by John Lennon in 1967. Harrison played the guitar while practicing “I am the Walrus” during The Magical Mystery Tour and by Lennon while recording a video session for “Hello, Goodbye.” The spectacular piece of Beatles history is estimated to bring $200,000-300,000 and offers collectors a once-in-a-lifetime opportunity to own one of the rarest pieces of Beatles memorabilia to ever be offered. The John Lennon/George Harrison played Beatles guitar will be on display at The Museum of Style Icons in Newbridge Silverware in County Kildare, Ireland from April 16th - May 8th. Continue reading Rare Beatles Guitar Rocks Julien’s Auctions in May. AUSTIN, Texas — The archive of Nobel Prize-winning writer and University of Texas at Austin alumnus J.M. Coetzee is available for research at the Harry Ransom Center, a humanities research library and museum at The University of Texas at Austin. The bulk of the archive traces the author’s life and career from 1960 through 2012. Coetzee was born in Cape Town, South Africa, in 1940 and graduated from the University of Cape Town. After working three years as a computer programmer in England, he enrolled in The University of Texas at Austin in 1965 to pursue his Ph.D. in English, linguistics and Germanic languages, which he earned in 1969. While at the university, he conducted research in the Ransom Center’s collections for his dissertation on the early fiction of Samuel Beckett. Continue reading Coetzee Archive Opens at the Ransom Center. NEW YORK — Bonhams third Asia Week auction, the Xi’an Incident: The Papers of Hyland “Bud” Lyon on March 20 featured never before seen letters and documents surrounding the pivotal 1936 Xi’an Incident and brought over $2.7 million. The unique sale was only eight lots long, although the auction took over an hour due to the continual bidding wars between the attendees, international phone bidders and online bidders primarily from China, Taiwan and Hong Kong — although Europe and the United States were represented as well. The salesroom brimmed with excitement, and occasionally broke out in applause, as lot after lot exceeded pre-sale estimates. Continue reading Xi’an Incident Letters and Manuscripts Brought $2.7 Million at Bonhams. New York — Swann Galleries’ auction of Early Printed, Medical, Scientific & Travel Books on February 28, saw active bidding in the room and on the phones, and 97 percent of the lots offered found buyers. The top lot in the sale was a scarce first edition in English of Juan González de Mendoza, The Historie of the Great and Mightie Kingdome of China, London, 1588, translated from the 1586 Madrid edition, which had been expanded to include the report by Antonio de Espejo of his 1583 expedition to New Mexico. It sold for $45,600*. By the same author was a first edition of Il Gran Regno della China, a collection of excerpts from the Italian version by Francesco Avanzo, with a double-page woodcut map of China, Florence, 1589, $11,400. Continue reading Early Travel Books and Religious Works Top Lots at Swann Galleries. Two collections of early photography — fashionable ladies and the architecture and landscapes of India — were the stand-out items in Bonhams sale £784,000 today (19.3.13) of Books at Photographs in Knightsbridge, London. Top item in the sale was an important collection of 37 albumen prints by Clemintina Maud, Lady Hawarden, plus 15 associated albumen prints (several possibly by Lady Hawarden), [c.1857-1864] which sold for £115,200. The second highest item in the sale was the photo album of a wealthy young Frenchman, Alexis De La Grange, who while having fun on a tour of India some 163 years ago, took some of the first photographs of the country between 1849 and 1850. His album offers 49 architectural views, most of which are Mughal, in northern India. The album sold for an above estimate price of £63,650. Continue reading Two Albums of Rare 19th-Century Photography Sold High at Bonhams. BLOOMINGTON, Ind. — Ruth Lilly Dean of University Libraries Brenda L. Johnson has announced the appointment of Joel Silver as the director of the Lilly Library, effective April 1. "Joel is known internationally within the academy for his impeccable credentials as a rare books curator, a prolific scholar and brilliant professor," Johnson said. "Over the past decade that Joel has served as associate director and most recently as interim director, Joel has become known for his collaborative leadership style and diligent work ethic. I have full confidence that he will be an outstanding director for the Lilly Library." Continue reading Joel Silver Appointed Director of the Lilly Library. WORCESTER, MA — On Friday, April 5, 2013, the American Antiquarian Society (AAS) will hold its sixth annual Adopt-A-Book event at which members of the general public will have the opportunity to “adopt” selected historic items from the AAS collections. This program will take place from 6 - 8 p.m. in Antiquarian Hall, 185 Salisbury Street in Worcester. Admission is $10 and drinks and hors d’oeuvres are included in the price of admission. Struck Catering is donating the food for the evening. For further information and to make reservations, contact Ann-Cathrine Rapp at (508) 471-2135, or consult the Society’s web site at www.americanantiquarian.org. At this event, people will have the opportunity to view rare books, pamphlets, newspapers, prints and other historic items that have found a home at AAS. They can then adopt one or more of these materials in their name, a friend’s name or in memory of a special person. An AAS curator will use this gift to buy something equally interesting in the coming year. Sample items for adoption include: issues of historic newspapers priced from $10-75; a broadside at $35; a children’s book for $40; a popular novel at $75; a volume of poetry for $100; and a lithograph or engraving from $100-500. Continue reading The American Antiquarian Society’s Adopt-a-Book 2013. Maastricht, 19th March 2013 — TEFAF announced today that it has entered into exclusive discussions with Sotheby’s to explore the possibilities of developing a high-end art fair for China, via Sotheby’s Joint Venture in Beijing with GeHua in 2014. “TEFAF Beijing 2014” would represent a ground-breaking collaboration between a leading international auction house and the world’s most important art and antiques fair. Continue reading TEFAF Announces Opportunity to Expand into China. London—The complete working papers for Sylvia Plath's poem Sheep in Fog, offering a vivid insight into the fragility of the poet's mind in the weeks leading up to her suicide on February 11, 1963, are to be auctioned at Bonhams, 101 New Bond Street, London, on May 8. The papers are featured in the Roy Davids Collection Part III: Poetry: Poetical Manuscripts and Portraits of Poets, and are estimated at £30,000-35,000, or $47,000-55,000. Continue reading Bonhams to Sell Key Sylvia Plath Poem. DALLAS — An intricate silver presentation frame holding a signed photograph from the Days of the Raj brought six times its pre-auction estimate to reach $46,875, leading Heritage Auctions’ two-day, $2.3+ million Estate Auction of fine and decorative art and collectibles, Feb. 23-24. The eclectic array was offered across three sessions, including one devoted to the second annual Gentlemen Collector Auction and the Brent Hyder Charitable and Education Fund collection, which brought a record crowd. Continue reading Heritage Auctions’ Estate Event Achieves $2.3+ Million. NEW YORK — Sandra Hindman, founder and owner of LES ENLUMINURES (www.lesenluminures.com) has announced a major month-long exhibition at the New York gallery from April 4 to May 4 called “Paths to Reform,” illustrating the importance of reform in the history of the medieval and early modern church. Continue reading Les Enluminures Gallery Exhibit on Medieval and Early Modern Church. MARCH 2013 — (San Clemente, Calif.) — The Surfing Heritage & Culture Center today announced that The Surf Riders of Hawaii, a truly unique and exclusive historical piece of surf history, will be one of the hallmark items in the Surfing Heritage Vintage Surf Auction, May 11, 2013 at the OC Fair & Events Center in Costa Mesa, California. Presented by Quiksilver Waterman Collection, the “California Gold” themed auction will feature historical surfboards and memorabilia with California flair from the 1920s through the 1990s. The auction will also include a live online option for those rare book and surfing enthusiasts who want to participate in this once-in-a-lifetime opportunity from anywhere in the world. Made by hand by A.R. Gurrey, Jr. between 1911 and 1915, The Surf Riders of Hawaii holds a revered place in the world of surfing. Initially made to sell in his local art shop in the still desolate Waikiki beach in the early 1900s, A.R. Gurrey, Jr. was one of the first photographers to capture the surfing phenomena, thereby opening the sport to world-wide attention. With only eight known versions of this book in existence, the one available at the live auction was the copy that was found by Gurrey’s family in his personal belongings. Continue reading Handmade Book by “Father of Surf Photography” Up for Auction. 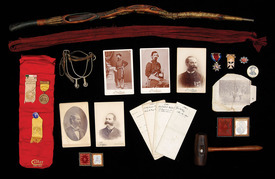 AMHERST, N.H.— A comprehensive archive of memorabilia relating to diplomat, Ellsworth Bunker, sold last night for $86,581, according to Amherst, NH-based auction house RR Auction. Ellsworth Bunker (1894-1984), who served the US in various capacities under seven presidents, most often remembered as having been a “hawk” in wartime Saigon, Ambassador Ellsworth Bunker made major contributions to American diplomacy for nearly 30 years. Continue reading Ellsworth Bunker Archive Sold For $86,581 at Auction. Maastricht, 13 March 2013. TEFAF Maastricht opens to the public on Friday 15th March 2013. The offering of fine and decorative arts is impressive as ever—the fair is full of the rare, the beautiful, the important and the recently discovered. TEFAF Maastricht takes place from 15-24 March 2013 at the MECC Maastricht. An arresting portrait by Velazquez (1599-1660) being exhibited by Otto Naumann (stand 351) entitled Portrait of a gentleman, bust length, in a black tunic and white golilla collar is on sale at the Fair for $14million. One of the highlights presented by Johnny Van Haeften (stand 304), is a magnificent, oil-on-canvas composition representing the meeting of Nausicaa and Odysseus by Jacob Jordaens (1593-1678). The study for this composition - a cartoon for a tapestry, which was never executed, - can be found with Jean-Luc Baroni (stand (382). The two works have been united at the Fair for the first time in many centuries. It is a tribute to the importance of TEFAF that such a serendipitous event should be possible. The famous still-life painter Balthasar van der Ast 1593/4 - 1657must have had a particularly good day when painting the still-life of fruit and shells now on display at Koetser Gallery (340). Continue reading Treasures AT TEFAF Maastricht 2013. The signed manuscript of Emily Dickinson’s letter-poem 'She sped as petals from a rose...', is to be sold on 10 April in Part I of the sale of The Roy Davids Collection Part III: Poetry: Poetical Manuscripts and Portraits of Poets at Bonhams, New Bond Street, London. The eight line verse, reproduced below, dates from around 1865 and is signed 'Emily' at the end and addressed on the back to 'Sue', written in pencil. It is estimated at $15,600 - 23,000 (£10,000-15,000). Continue reading Important Emily Dickinson Manuscript at Bonhams. In an age of technological revolution, many trades, crafts, and once hand-worked skills are increasingly diminishing with advancing computer technology, as we have seen in the past with the industrial revolution and the advent of mechanical production. Continue reading “To Preserve & Protect” at Booklyn. Today, the Antiquarian Booksellers’ Association of America joined with the Authors Guild, the American Association of Publishers, and other organizations, objecting to the Internet Corporation for Assigned Names and Numbers (ICANN’s) plan to sell top-level domains to private companies. Online retail giant Amazon has bid to be the exclusive custodian of .book, .author and .read domains. ABAA President John Thomson called the move “anti-competitive” and a threat to the small businesses that make up the Association. Continue reading ABAA Objects to Amazon Plan on Domain Names. March 2013—New York. Christie’s is pleased to announce the sale of one of the most celebrated American book collections —The Collection of Arthur & Charlotte Vershbow. The collection will be sold throughout 2013 in four parts, with an inaugural evening sale of highlights from Schongauer to Chagall on 9 April and The Middle Ages and the Renaissance on 10 April. Highly regarded among their contemporaries, the collection formed by the Vershbows is truly unparalleled, with its unique integration of illuminated manuscripts, books and prints. Continue reading Christie’s Presents The Collection of Arthur & Charlotte Vershbow. DALLAS — A copy of The Beatles’ Sgt. Pepper’s Lonely Hearts Club Band — sporting four crisp signatures by the Fab Four on the iconic gatefold — is expected to bring well in excess of $30,000 as the top highlight on the music side of Heritage Auctions’ March 30 Entertainment & Music Memorabilia Signature® Auction. Authenticated by two leading Beatles signature experts, the specimen is being called one of the top Beatles autographs they’ve examined in more than 30 years. Continue reading Finest Beatles-Signed Album at Heritage Auctions. Greater Boston’s largest exposition of rare books, manuscripts and vintage photos is the perfect setting for one of the most controversial and provocative exhibitions of our time! When Richard Minsky married the time-honored skills of the bookbinder with pop art culture, the results were nothing short of spectacular. He created a medium that was fresh and new—intriguing book art that not only combines craftsmanship with pointed commentary, but also reflects the artist’s own take on one of the most pressing issues of our time—the infringement of our rights! Continue reading Minsky Exhibition, 75 Dealers at Boston Book, Paper & Photo Expo. March 11, 2013 — London, U.K. — The Folio Society announces the publishing of an impressive four-volume edition of Three Kingdoms. Hailed as ‘The Iliad of China’, it is an epic historical novel documenting the turbulent years when the Chinese empire was divided into three warring kingdoms. Chinese author-in-exile Ma Jian introduces this edition available at http://www.foliosociety.com/book/THK/three-kingdoms ($275). In Chinese culture, the era of the Three Kingdoms (AD 168-280) has achieved the status of legend, and this remarkable novel, written in the fourteenth century, is one of the great classics of Chinese literature. Arguably the most widely read historical novel in late imperial and modern China, this extraordinary work is essential reading for anyone who seeks to understand Chinese civilization. Continue reading The Folio Society Announces Illustrated “Three Kingdoms”. Beverly Hills, California — March 11, 2013 — Julien’s Auctions, the world’s premier entertainment celebrity memorabilia auction house has announced its Hollywood Legends auction of over 800 items including exceptional screen worn wardrobe, props, photographs, jewelry and celebrity owned items to be held on April 5 & 6, 2013 at Julien’s Auctions Beverly Hills Gallery. From the only surviving vehicle from the Green Hornet production to the fanciful Munchkin’s hats in the all-time classic “Wizard of Oz,” Julien’s will not disappoint at this year’s Hollywood spectacular. Unique to this auction is an unsurpassed collection of publicity stills and photographs from over 6000 films from some of the earliest days of Hollywood and through the 1960s. The collection includes original key book images, wardrobe test images, promotional and scene stills and images by photographers Clarence Sinclair Bull, Irving Lippman, M.B. Paul, Malcolm Bulloch, A.L. Whitey Schafer, Oliver Sigurdson, Ernest Bacharach, Chronenweth, Christie and many others. This is the first time Julien’s Auctions has presented this collection to the public. Continue reading Julien’s Auctions Announces 2013 Hollywood Legends Auction. More than 200 of the finest and most poignant photographs of the American Civil War have been brought together for the landmark exhibition Photography and the American Civil War, opening April 2 at The Metropolitan Museum of Art. Through examples drawn from the Metropolitan’s celebrated holdings of this material, complemented by exceptional loans from public and private collections, the exhibition will examine the evolving role of the camera during the nation’s bloodiest war. The “War between the States” was the great test of the young Republic’s commitment to its founding precepts; it was also a watershed in photographic history. The camera recorded from beginning to end the heartbreaking narrative of the epic four-year war (1861-1865) in which 750,000 lives were lost. This traveling exhibition will explore, through photography, the full pathos of the brutal conflict that, after 150 years, still looms large in the American public’s imagination. The exhibition is made possible by The Horace W. Goldsmith Foundation. Continue reading Photography and the Civil War Exhibit Opens Next Month. DALLAS — Marlon Brando’s 1954 ‘Best Actor’ Golden Globe award for his performance in On the Waterfront is expected to bring $10,000+ to highlight a never-before-offered selection of his personal property in Heritage Auction’s March 30 Entertainment & Music Memorabilia Signature® Auction. The award is one of two of Brando’s Golden Globes offered — the second was won by the actor for being named World Film Favorite a year later in 1955. For a now unknown reason, though in a classic Brando-esque move, he threw this second award against the wall at his home, breaking off the top female statuette and scratching the placard — the piece was not repaired until decades later and still carries evidence of its damage at Brando’s hands. It carries a pre-auction estimate of $6,000+. Continue reading Marlon Brando Memorabilia at Heritage Auctions. Los Angeles — Bonhams is pleased to announce its June 24 auction of the Doll Collection of Alexandra and Sidney Sheldon in Los Angeles. The 400 lot collection was compiled by the noted author and his wife and features stunning, hand crafted dolls from the 1920s, 1930s and 1940s, primarily from the Lenci Company. Highlights from the famed maker will include celebrity inspired dolls such as Rudolph Valentino and Madame Pompadour; a series of sports figures and international dolls from China, Russia, Scotland and Spain, among others. Founded in 1919 by Elena Konig Scavini, the Lenci Company is best known for its iconic, beautifully crafted dolls made from manufactured and processed felt. The high end dolls became popular in the 1920s and gained many admirers among adult collectors that included Queen Elena of Savoy, Josephine Baker and many celebrities of the day. Continue reading The Collection of Alexandra and Sidney Sheldon at Bonhams. DALLAS — A magnificent and massive Casablanca (Warner Brothers, 1942) six sheet (81" X 81") large format movie poster, one of just two copies known, is expected to bring $60,000+ when it comes across the auction block as the centerpiece of Heritage Auction’s March 23-24 Vintage Movie Poster Signature® Auction. Continue reading High Expectations for 1942 Casablanca Six Sheet at Heritage Auctions. New York City, March 6, 2013—PEN American Center, the largest branch of the world’s oldest literary and human rights organization, announced yesterday at its Annual Members’ Meeting the newly-elected and reelected officer trustees of the Board, including John Troubh, Executive Vice President, and Jeri Laber, Vice President. Other newly-elected or reelected trustees of PEN’s Board are Jennifer Egan, Nathan Englander, Wendy Gimbel, Erroll McDonald, Elisabeth Sifton, and Andrew Solomon. Biographical information of these Trustees can be found here. Continue reading PEN American Center New Officers and Trustees Announced. San Francisco, CA — MARCH is pleased to present Photographs, an exhibition of Paulette Tavormina's exquisite still lifes. The show opens March 14, 2013 and continues through June 1. Tavormina's dramatic images reflect the sumptuous detail of 17th century Old Master paintings. Using a contemporary medium and a modern approach, her vibrant photographs of food and flora are reminiscent of Dutch, Spanish, and Italian still-lifes of the Golden Age. To create these luscious compositions, Tavormina collects “props”—such as butterflies, shells, dried flowers and ceramics—which evoke the still-life vernacular and imbue each tableau with allegorical meaning. There is a wonderful disorientation as Tavormina’s contemporary pieces evoke the trompe l’oeil effect of Old Master still-lifes. Continue reading Photographs, an Exhibition of Paulette Tavormina’s Still Lifes. A deeply characterful portrait of Seamus Heaney by Peter Edwards, who also painted the portrait of the Irish poet which hangs in the National Portrait Gallery in London, is be auctioned at Bonhams, 101 New Bond Street, on 10 April during the sale of Roy Davids Collection Part III: Poetry: Poetical Manuscripts and Portraits of Poets. Estimated at £6,000-8,000, it is to be sold with the original pencil drawing made at Heaney’s Dublin home in 1987 from which the portrait was subsequently painted. Seamus Heaney wrote about the pleasure of sitting for Edwards in his 2008 memoir ‘Stepping Stones’. Continue reading Seamus Heaney Portrait Leads Sale of His Work at Bonhams. Cincinnati, OH — March 2013: The first Natural History of North America was published in 1731 by an Englishman, Mark Catesby. Since that time, there has been a steady stream of works on that subject, an attempt to identify what new and amazing life was here. These early naturalist explorers used words and images to describe an as yet little known continent and its natural inhabitants. The North American Experience: Early America Illustrated with “Forms of Life” Art Exhibition by the 5300 Group opens to the public March 25, 2013 — runs through June 21, 2013. Continue reading The North American Experience: Early America Illustrated. BEVERLY HILLS — Irving Penn’s iconic close-up portrait of Picasso is expected to bring $60,000+ to lead a rare selection of four different Penn portraits offered in Heritage Auctions’ March 23 Photographs Signature® Auction. The Penn works are offered amid a cavalcade of work by noted artists, ranging from Ansel Adams’ Portfolio V, expected to bring $30,000+, and Richard Avedon’s Kennedy Portrait, triple signed and inscribed by both the artist, JFK and Jacqueline Kennedy, expected to bring $15,000+. All lots come from private collections and will be presented at Heritage’s Beverly Hills location. Continue reading Irving Penn, Richard Avedon Highlight Photographs Auction at Heritage. NEW YORK — A three-cel set-up from Walt Disney’s classic Lady and the Tramp realized $33,460 and a cel featuring Mickey Mouse as the Sorcerer's Apprentice from Fantasia sold for $26,290 during Heritage Auctions’ Animation Art Signature® Auction. The Feb. 21 auction sold 93.9% by value and 97.8% by lot. Continue reading Classic Disney Cels Lead $923,000+ NY Animation Event at Heritage.